You may be an expert at underwriting, but how about resume writing? 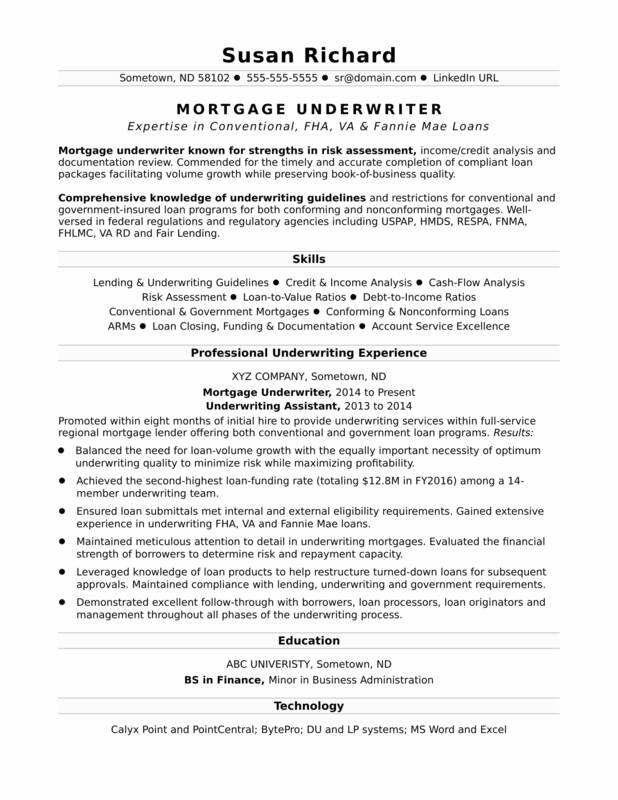 Use this mortgage underwriter sample resume as a guide to preparing your resume. You're well-versed in underwriting guidelines, but do you need a refresher on resume guidelines? To be a successful candidate for mortgage underwriter jobs, resume expert Kim Isaacs says it helps to have a comprehensive resume. Use this sample resume for a midlevel mortgage underwriter that Isaacs created below as a guide to preparing your own resume. You can also download the mortgage underwriter resume template in Word. And if you need more help, let the experts at Monster's Resume Writing Service create a high-impact resume for you that will impress employers. Jobs for loan officers are projected to grow by 11% (or 36,300 jobs) from 2016 through 2026, which is faster than average, according to the Bureau of Labor Statistics (BLS). You'll find the highest level of employment for this job in the following states: California, Texas, Florida, North Carolina, and New York; and in the following metropolitan areas: New York City; Anaheim, CA; Los Angeles; Chicago; and Phoenix. As a loan officer, you can expect to earn a median wage of $64,660 per year, or $31.09 per hour, according to the BLS. Additionally, you can search for mortgage underwriter jobs on Monster. Mortgage underwriter known for strengths in risk assessment, income/credit analysis and documentation review. Consistently commended for the timely and accurate completion of compliant loan packages facilitating volume growth while preserving book-of-business quality. Comprehensive knowledge of underwriting guidelines and restrictions for conventional and government-insured loan programs for both conforming and nonconforming mortgages. Work collaboratively with team members to drive deals to successful funding and close. Balanced the need for loan-volume growth with the equally important necessity of optimum underwriting quality to minimize risk while maximizing profitability. Achieved the second-highest loan-funding rate (totaling $12.8M in FY 2011) among a 14-member underwriting team. Ensured loan submittals met internal and external eligibility requirements. Gained extensive experience in underwriting FHA, VA and Fannie Mae loans. Maintained meticulous attention to detail in underwriting mortgages. Evaluated the financial strength of borrowers to determine risk and repayment capacity. Leveraged knowledge of loan products to help restructure turned-down loans for subsequent approvals. Maintained compliance with lending, underwriting and government requirements. Demonstrated excellent follow-through with borrowers, loan processors, loan originators and management throughout all phases of the underwriting process.